Product Group: Floor Standing Fountains Bookmark To MyTotalUSA! 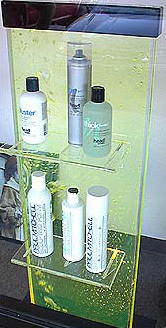 Catch the attention of potential customers with this bubble panel retail display shelf. This attractive floor-standing bubble panel has 2 clear acrylic shelves to place your products. The bottom shelf has 14" vertical clearance. Each shelf is 12" wide, 6" deep. This shelf is perfect for eye-catching placement of products! Customers will be attracted to the lighted bubbles, which then brings them to your product. The water sparkles in the sunlight, or internally lights up for night time use. Bubble panel stands 51" tall, 14" wide, and is constructed from heavy duty 1/2" thick optically clear acrylic, and has a black acrylic base and top cap. Custom shapes, sizes and styles available! E-mail us or fill out the form below for custom quotes for your bubble displays. Water maybe dyed any color you choose, or equipped with optional color wheel.